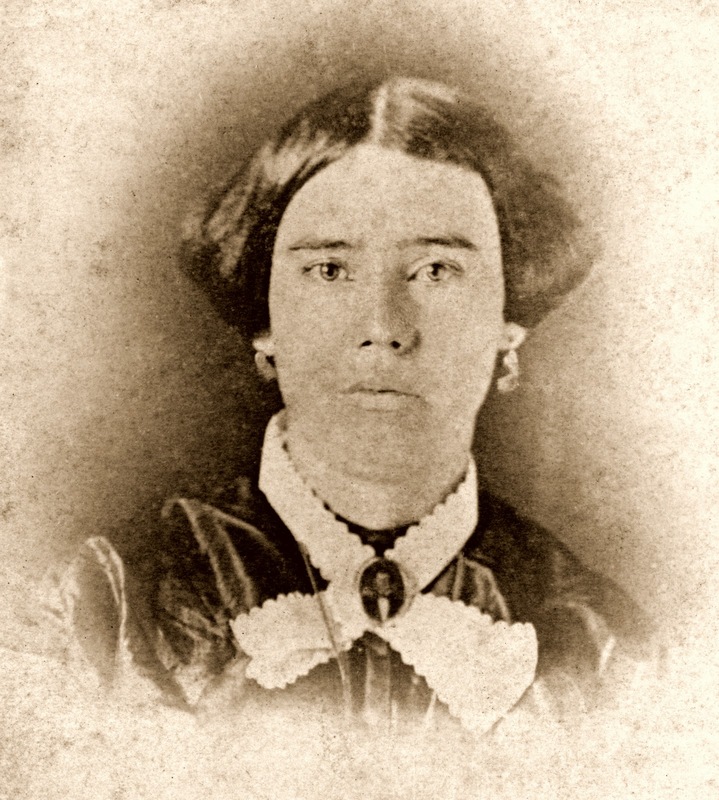 Spotsylvania Civil War Blog: Is This The Widow Susan Alsop? A treasure from the attic. Is This The Widow Susan Alsop? A treasure from the attic. When retired museum professional Terry Dougherty entered the attic of the Alrich house near Spotsylvania Courthouse, he knew he had stumbled upon a goldmine of Spotsylvania genealogical material. Last summer, Dougherty paid a visit to the house and Alrich descendant John Alrich-Altman. The majority of the home's contents had been sold off in an estate auction in June, but the attic had remained untouched and as it turned out, packed with an archive of historical images and memorabilia of the family. 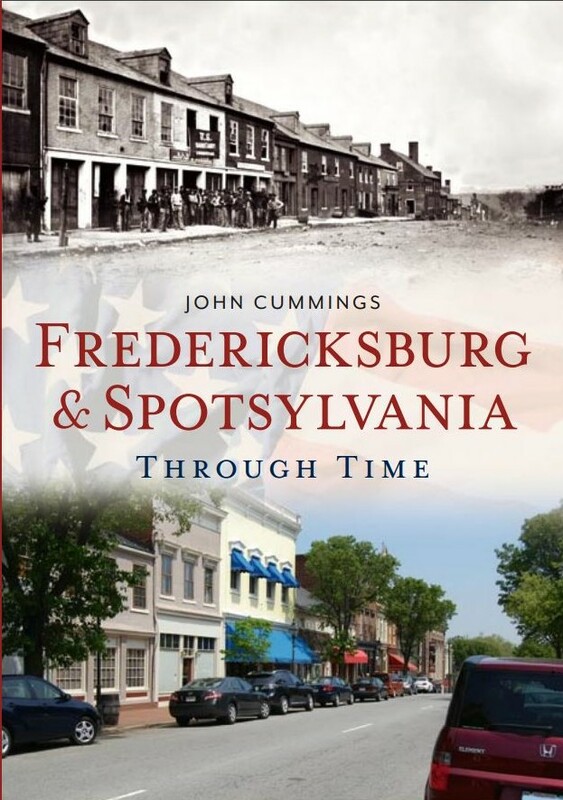 Many of the items are now on temporary loan to Spotsylvania County for a museum exhibit being prepared by Dougherty as a volunteer to the County. It is a Herculean effort, but one that Dougherty relishes. The display is scheduled to open in late May of this year in the Courthouse Village government office building. 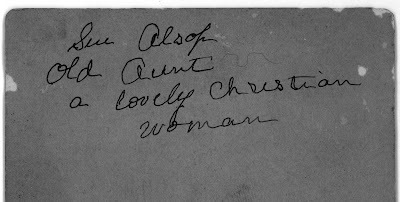 Perhaps one of the most intriguing finds was a photograph with the inscription, "Sue Alsop, Old Aunt, a lovely Christian woman". Immediate speculation is that this is a photograph of the matron of the Alsop Farm of the May 19, 1864 battle fame. Susan M. Alsop was only twenty-one in December 1860 when her husband James Addison Alsop died from the effects of a carriage accident. Susan and her six month old son, John, continued to live on their Spotsylvania farm, witnessing the horrors of battle virtually on the threshold. Susan lived out her days there until she passed in 1915. This copy of the photograph may in fact have been made as a memorial keepsake for family members in 1915 as it is an enlargement of the 1860s period original, mounted on a "cabinet card stock", typically done after the turn of the century for such purposes. scan of the original by John F. Cummings. The inscription on the back is shown below. The interesting features of the photograph are the trappings of mourning etiquette that the woman is wearing, which taken by themselves are supportive of this being the "Widow Alsop". She is wearing a photo broach of her deceased husband, pinned to her collar, a tradition of Victorian era mourning practices. Considering that the collar is white, this indicates that the photograph would have been made after the end of "Full Mourning", which was to last for a year and one day. In full mourning the widow was required to wear all black for the entire period. After entering second stage mourning, a widow could add some color to her clothing, usual a white collar and cuffs. This being second stage mourning would indicate that it was taken no earlier than late December of 1861. Considering the distance to photographers in Fredericksburg from her Spotsylvania home, it is even likely that the photograph was made in early 1862 with the arrival of weather conditions more hospitable to travel on country roads. It should be noted that the hairstyle this woman is wearing is typically that of the 1850s era, a style consisting of padded wings over the ears. If this is indeed THE Susan Alsop, widow of James Addison Alsop, one has to consider that she is wearing a hairstyle that would have been out of vogue by the early 1860s. This does not mean that she could not have opted to continue this style, but typically a young woman as she was then, approaching 23, would have been more inclined to keep up with fashion of the day. Further scrutiny will be required of this and the hundreds of other images found in the Alrich attic. We are fortunate that they have survived to provide a window into the county's past. (Dabney house during the Civil War), and the lone attic window. Photographed June 5, 2010 by John F. Cummings. Very exciting stuff, John. Finding a trove like that in an attic would be a dream come true. Good work on the photograph. Very nice find John. I think it all likely adds up to being Sue, and this photo more than any words we can conjure explodes the traditional visual image associated with "Widow Alsop." Very nice. Thanks for sharing. Mr. Dougherty certainly deserves the credit for being at the right place at the right time. It leads one to imagine what invaluable material culture still resides in the attics of Spotsylvania County. 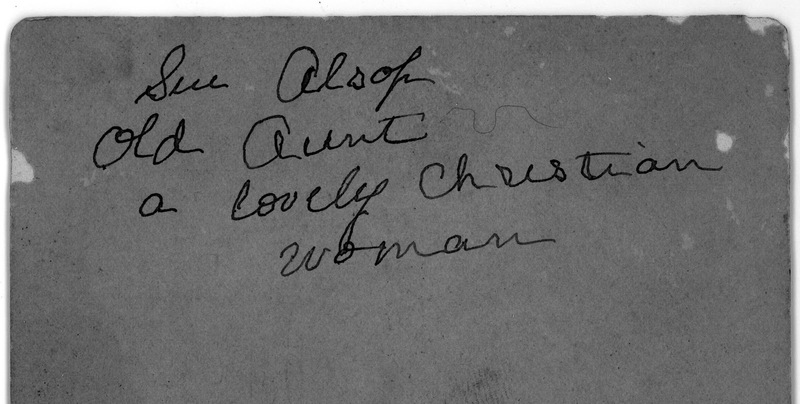 We are also indebted to Mr. John Alrich-Altman for his sharing of the family archive. Excellent Find. Hope we get to see more from this treasure trove on here. Not only is the hairstyle one of the 1850s but so too is the collar. It may be Sue Alsop (I mean it seems pretty likely based on the handwriting on the back) but I don't think it is a wartime image. 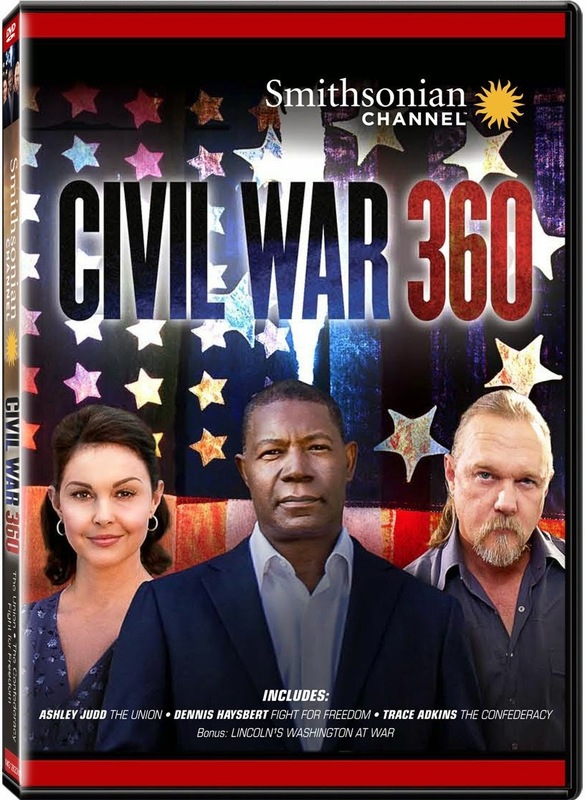 If the image were taken in North Carolina of a North Carolinian, I might be willing to rethink my position (a goodly number of images of N.C. women with Confederate troops show they were clinging desperately to the 50s even among the younger groups). However, that's another post for another time somewhere else. That is a very interesting point you make about the North Carolina women, something till now that I have never put thought into, but you are quite right. Have I noticed something similar with Texas images? I would enjoy reading your thoughts on this as you suggest, in another venue. I will now, after some thought last night on what might be documented here as a psychological consideration, present some possible explaination. First off, Susan and James were married in the late 1850s (exact date I don't know), but we must assume that the union was consummated sometime after the marriage ceremony. For Christian couples, as the inscription promotes Susan as a devout Christian, the couple comes together in the eyes of God during their creation of a child. Their son John was conceived in September of 1859 by all reasonable calculations. It is possible and very likely that Susan, at roughly 19 or 20 considered herself being brought to womanhood by her relationship with James, who would be the only man she ever knew in that respect. She never remarried and Alsop family tradition maintains that she spurned the advances of her brother-in-law, Frank Alsop. She survived the loss of her husband and successfully maintained the family farm after his passing. 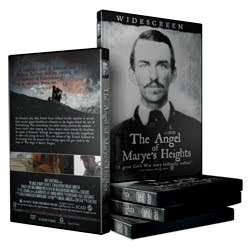 It may be something to consider in her character, that she would remain the woman that James made her. Further examination of the photo broach on her collar suggests that it may have been derived from a wedding portrait, since there appears to be a hand visible on the right shoulder of the probably seated male figure. This may very strongly suggest an adherence of the very short marriage and the union that brought their son into the world. We can not in all respect to the values of the day, dismiss the possibility of such devotion. Lastly, with these considerations, it is possible that within a year of her becoming a widow, Susan is adhearing to the look and clothing she maintained during her courtship and marriage to James. Not saying that things could not have become less rigid as the years went on, but at that moment in time, this was how she defined herself. With this possible observation of the broach image, I intend to assist Mr. Dougherty in examining the other photographs in the collection, most of which are unidentified, and hopefully locating one that may be the full image of the two together.